Comes standard with 8 antique brass D-Ring Pulls. 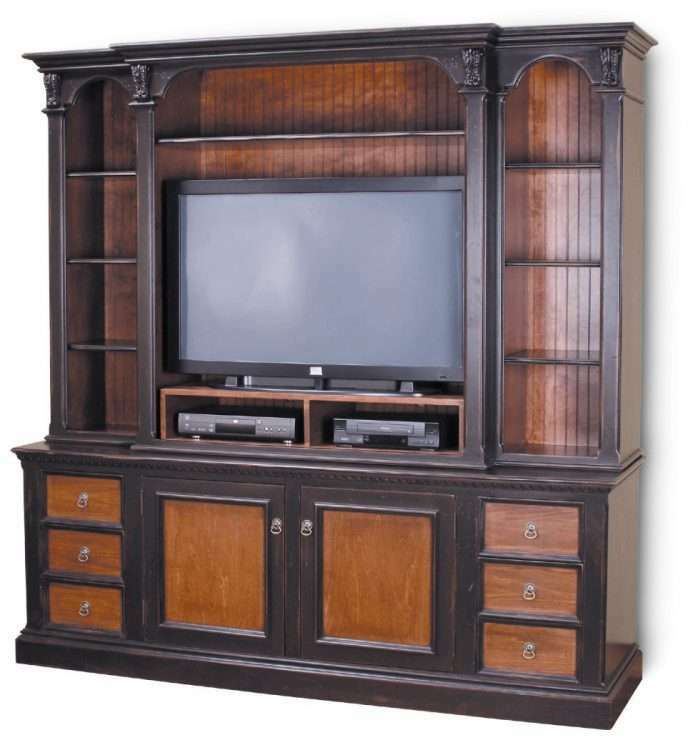 Top section features open display with beadboard interior backs, 1 adjustable shelf for top center, 6 adjustable shelves for top sides, and 1 removable VCR bridge. Base section features hidden divided storage with 2 adjustable shelves, and 6 drawers with metal/nylon drawer glides. Intended for use with a TV, this unit is drilled for component wires behind the left/right sides of the removable VCR bridge. Base Only is available as CM82B. Ships in 6 corrugated cartons: Cabinet top (172 lbs), cabinet base (194 lbs), large shelves (22 lbs), medium shelves (30 lbs), small shelves (19 lbs) and VCR bridge (25 lbs), on 1 wooden pallet (75 lbs).